There are tons of manga cafes in Japan, and they keep struggling to differentiate themselves by offering unique services. One manga cafe located in Tokyo, “Comic Buster WILL BE Oimachi” has a cat cafe called “Maru Maru” within it. From the ground floor to the forth floor (half) of their building is their manga cafe space, and the other half of the forth floor and the fifth floor is their cat cafe space. The manga space and the cat space are divided with a door. 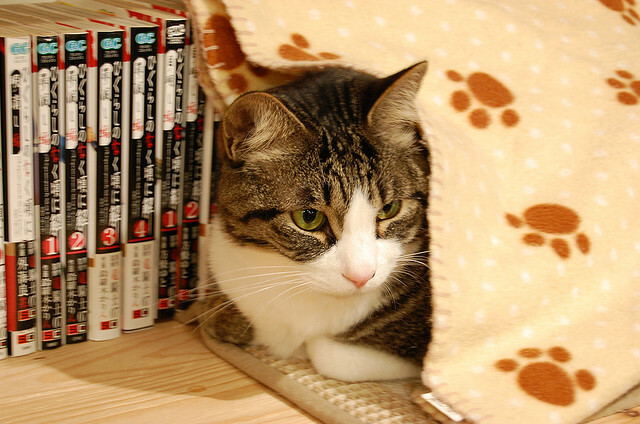 However, customers of Maru Maru can use the manga space as well, bringing manga comics to the cat space. Manga reading time with snuggling cats sounds like heaven! Unfortunately, it’s not possible for customers who enter from the manga cafe side to go see kitties and bring their favorite fur-babies back to the manga space.